The oven thermostat and how it works can be described simply. The thermostat is an on-off switch that controls the heating element. The sensor and the thermostat work together inside the oven. The sensor is a long, narrow tube normally located at the top and back of the oven. The thermostat won’t shut off the oven until the heat sensor indicates that the optimum temperature has been reached. You won’t be able to increase the speed of heating. If you suspect the thermostat isn’t working properly it may have to be recalibrated. This can be done by pre-heating the oven and testing with an oven thermometer. If the temperature difference is more than 10 degrees Celsius the thermostat and the sensor may need replacing. 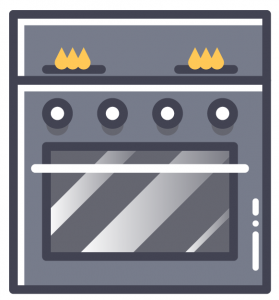 A faulty temperature sensor will cause the oven not to heat to the correct temperature. If food is taking longer to cook, or is undercooked when cooking time is completed this is due to the oven not reaching the desired heat. You need to make sure that the temperature sensor isn’t touching the interior oven wall. This can affect the accurate measurement of the internal temperature. If this is the case you can reposition it. The resistance of the sensor should rise with the temperature. You can test that the sensor is working by using an ohmmeter. And then you can get the sensor replaced if it appears to be defective. When cooking isn’t even some parts of your food may be overcooked. And some may still be raw. This indicates that the internal temperature of the oven isn’t matching the temperature dial setting. The temperature sensor can be the reason why as it can wear out over time. Use the ohmmeter to test the function. And arrange for a replacement part to be fitted. Oven thermostat problems and temperature sensor issues can easily be fixed by trained and qualified professionals. High-quality appliance repairs will be carried out for an affordable price. And you’ll get a six-month parts and labour guarantee. Your oven will quickly be back to full working order.